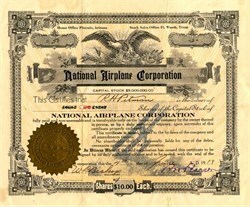 Beautifully engraved certificate #5 from the National Airplane Corporation issued in 1919. This historic document has an ornate border around it with a vignette of an eagle and an overprint of an early Bi Plane. 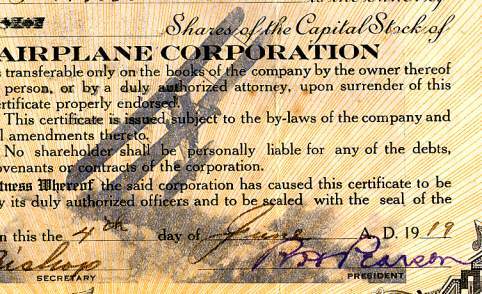 This item has the signatures of the Company's President (Pearson) and Secretary (W. Bishop) and is over 87 years old. Some signs of wear on folds. This is the first time we have had this certificate for sale and believe it to be quite rare. In 1919, the first air cargo company in Fort Worth was the National Airplane Company. The company was founded in 1919 in Fort Worth, Texas. 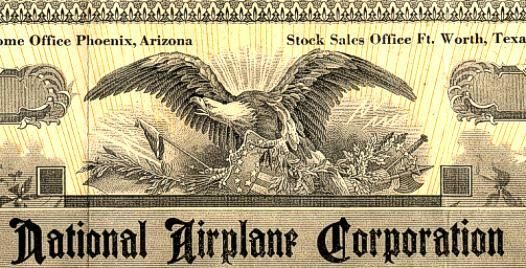 It started as the Ft. Worth Aerial Transportation Company but later became the National Airplane Corp. They did not last 6 months, but they were considered one of the the first airlines in the United States.